Duke Riley, the artist who did my Behemoth tattoo, has an event in Flushing-Meadows, Queens this Thursday. It’s not a normal “gallery” event either, it’s a naval battle footfight. 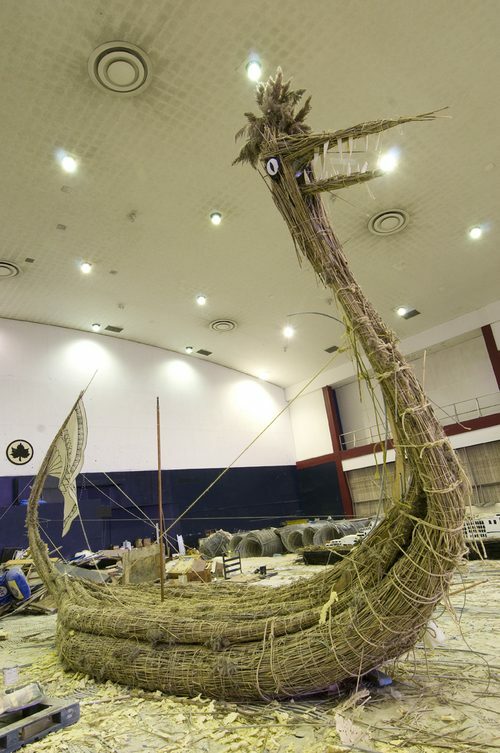 Duke and his minions constructed boats from the reeds in the neighboring park and will set them assail in the reflecting pool outside the Queens Museum of Art at 6:30 on the 13th of August. Looks so epic! Good job Duke! Duke Riley has always been interested in the space where water meets land within the urban landscape and is known for art work that is an idiosyncratic mix of performance art, sailor’s craft and historical re-enactment. Upon QMA’s invitation for an artist residency, Riley’s life-long fascination with the culture and topography of waterfronts, and proclivity for margins – of society, history, etc. – were immediately focused on the decommissioned World’s Fair Ice Rink adjacent to the museum. The sight of the vast oval arena, a sea of refrigeration tubing and white sand, brought an instant association with ancient Roman coliseums that were flooded to stage violent naval battles or Naumachia for the delight of spectators in the Empire’s effort to distract the masses from societal collapse by indulging them with free bread and extravagant spectacle.